wired and wireless Internet access in meeting rooms. and choice of 11 dining options. 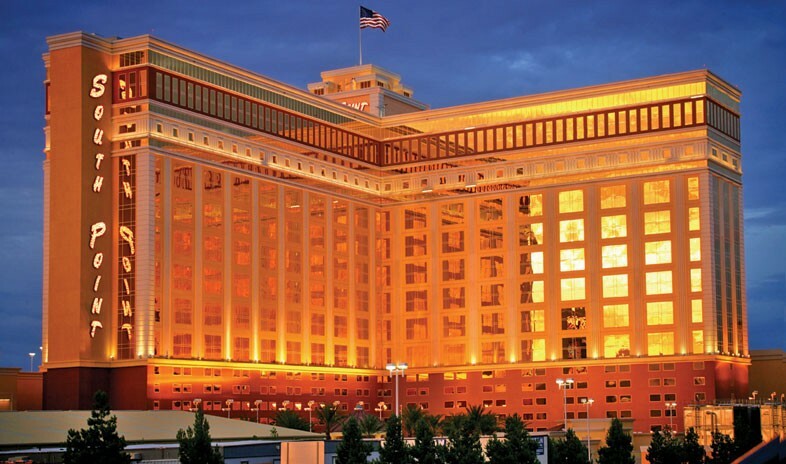 Located away from the distractions of the central Las Vegas Strip, the South Point Hotel and Spa offers a convenient alternative on the south Strip for meetings, trade shows, board meetings, and events of all kinds. The range of space options for groups begins with the 80,000-square-foot, pillar-free and carpeted Exhibit Hall. It continues on to an additional 75,000 square feet of dedicated conference space that includes a 21,600- square-foot Ballroom and 22 breakout rooms. Guests stay in 2,163 accommodations within the 25-story hotel. While the standard rooms measure among the largest in town and boast all the amenities expected from a first-class Las Vegas property, the suites command penthouse views of The Strip, surrounding valley, and mountains. Every guest room and suite comes with complimentary Internet access. Eleven dining options range from 24/7 room service to a traditional deli, 24-hour Chinese-American cafe, fine-dining steak house, and Italian, Mexican, sushi, seafood, prime rib, buffet, and gourmet restaurants. A sprawling lagoon-style swimming pool, 16-screen movie theater, 64-lane bowling alley, spa, fitness center, and 80,000-square-foot casino complete the full spectrum of Las Vegas attractions on-site. As a planner in the equestrian industry, I can't think of a more perfect place to hold an event. Mo Robinson in Sales and Valerie Steele in Convention Services are both so accommodating and easy to work with. It may not be right on the strip, but it's close enough. You get so much value for your dollar when it comes to overnight rooms and food and beverage. Plus, they have a complimentary shuttle to and from the strip. Open Systems, Inc. has used the South Point for our partner and customer conferences for the last three years. As a meeting planner who has worked with hundreds of venues, I find the staff at South Point to be a breath of fresh air. They are an experienced team that work together like a well-oiled machine.The Meeting space is ideal for us because our attendees don't have to walk through the casino and we can have all our functions on the same floor. We also LOVE having the Showroom for our private parties. The hotel offers enough amenities so you can feel like you're on the strip without the crowds and high prices. I wouldn't hesitate to recommend South Point for a great meeting space. It has been wonderful to work with a property that works with us to keep our costs in line. South Point definitely gives us value for our dollar. Another value that can't be determined in dollars and cents is the fact that your hotel and convention staff has very little turn over. Our confidence in using South Point is what led us to also recommend the property for the WaterSmart Innovations Conference which we manage and 2012 will be the fifth year for that conference at the South Point. Isuzu would highly recommend the South Point for any meeting you may plan in Las Vegas. We used the new hotel in January of 2007 for a launch event that took over the hotel. Since that meeting, we have used South Point more than 15 times for various events, and meetings, from event that have taken over the hotel to just a small group, the staff at South Point will treat you the same. From the sales office to the staff working on the event, they're all about making sure that you're having the best event possible.